Reader Mark H. sent along a link to a behind-the-scenes podcast called the Better Call Saul Insider where they talk about the hummingbird in the show. Unreal. According to the folks on the podcast, all of whom work in the crew or production for the show, the hummingbird was not lured in with a green screen behind it, but just a stroke of luck. 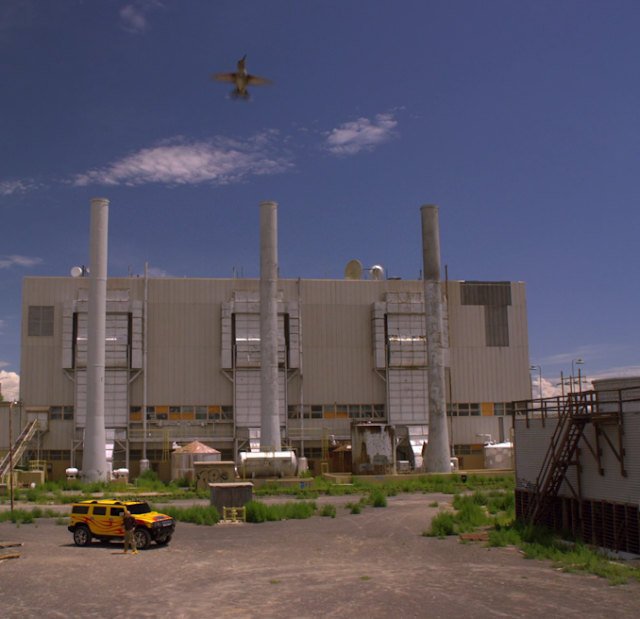 The crew was shooting the factory shot using an unmanned camera on a crane, and the hummingbird just happened to zoom into a take. Bob Odenkirk (making his second Birds at Large appearance) cracks that the bird is actually just a tiny drone sent over from one of the CSI shows. But to you and me, it's a Broad-tail. If you want to look for quality, look at the details. It's true for cars*, it's true for jewelry*, it's true for clothing. * And it's true for TV shows. Better Call Saul is a quality TV show, one of my current favorites. Care is taken in all aspects. The plot is intricate, the settings are rich, the acting is considered. Even the birds are right. 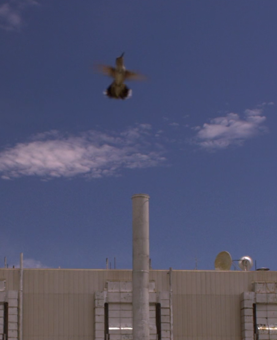 A friend sent me some screenshots from one of this season's episodes, showing a hummingbird flying in the foreground. Hummingbirds are typically CGId when they appear onscreen - like the Xantu's in The Big Year, right? - because they're so fast and because not many people keep them. I asked Benay Karp, the owner of an animal rental company in Los Angeles, if the bird was one of hers. She said it wasn't, that it was likely a wild bird that the production team brought to the camera with a feeder. She thought there'd be a green screen behind the bird onto which they could later project the scene as you see it above. Very cool. So what species is it? If we're going with the "live bird" thinking, this is some species that appears wild in New Mexico, where the show is filmed. That eliminates Ruby-throated, which is helpful. I've never really looked into it because I haven't birded there much, but there aren't a ton of hummers in New Mexico. I don't see the red in this bird that would indicate a Rufous Hummingbird, and so for regulars in the state we're left with, like, Broad-tailed, Black-chinned, and Calliope? I think this is too big-looking for a Calliope. I just think that. I don't have a ton of experience with the other two birds, but the white tail corners on this bird look pretty extensive. The bill doesn't look super-long either. I think this is a Broad-tailed Hummingbird. Good bird! Thanks, Saul. *I have never owned quality clothing, a nice car, or really any jewelry. I've just heard this is true. Why not a female Black-chinned Hummingbird. I don't see any hint of red on the flanks or tail, which I'd expect to see in the spread tail shot if it were a Broad-tailed.